A witty walk through the minefield of tweeting, twitter, and the many uses we have socially for it. Take a trip through trending topics, get stuck in writer hell, and marvel at the ability to make jokes out of current events. From serious poetry to a scandalous twist on improper grammar, this fast paced take on the brevity of chatting in 140 characters or less will have you falling in love with tweeting all over again. Geeky, writerly, fun for everyone. If you take your humor with insight, self-deprecation, pithiness, and more than a little geekdom, this might be just the lift for you. Witty observations in a Tweet! 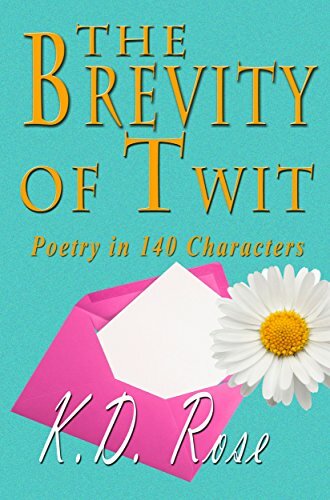 KD Rose's Brevity of Twit is a collection of tweets she wrote between 2012 - 2014. Each chapter has an introduction of her understanding of writing and how Tweets are a new literary form that presents challenges to contemporary writers. Who should read this? Those who would like to know more about the literary possibilities of Tweets or about literature (particularly poetry) itself without needing to know the technical aspects of Tweeting. The book is also an invaluable compendium of more literate tweets. This collection should be on any social-media writer's flash drive. Although anyone can join Twitter and wade through a sea of mundane observations (many that contain mostly @'s , #'s and links), you'll get a great collection of gems in this book. Like a good anthology of poetry, I frequently return to Brevity to see how a witty writer would have said something of interest.